But for the ladies (and gents, why not) who want to have a silky smooth body, but are *ahum* blessed with strong hair growth, like me, you know hair removal can give you a hard time. There are many ways to remove hair from your face and body. You can think of shaving, waxing, threading (maybe not for the body, unless you’re a VERY patient person) and laser hair removal. 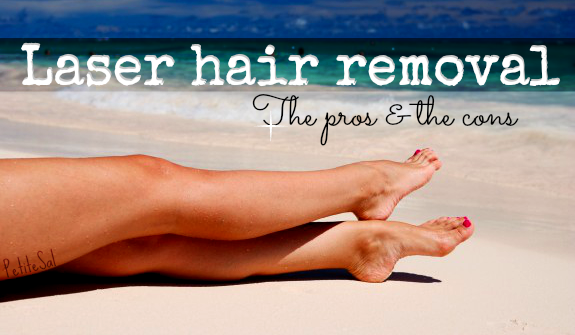 They all have their pros and cons, but all in all, I think laser hair removal wins by far! Keep on reading to find out about the pros & cons, and I also wrote about a little experience. So first things first: what is laser hair removal? Because I found it hard to make a good English sentence, I decided to quote gnet.org: Laser hair removal uses an impulse of light which heats up hairs which are shaved prior to treatment. The heat travels down the hair into the hair shaft and and destroys the hair follicle, preventing regrowth of hair. Long-term results vary from person to person, but if you are light skinned with dark hair you will be an ideal candidate. It takes several treatments, six weeks apart to achieve hair-free status, with maintenance treatments usually required every now and then. Okay, so that pretty much sums it up . It's true that it's more suitable for lightskinned girls with dark hair, but to be honest I think those are the persons who need it the most (speaking from experience). The biggest pro is: it’s permanent (but results differ per person). After a few treatments your hair doesn’t grow back and you’re free from the burning shackles of always removing facial and body hair! Don’t expect this to happen after one treatment; it takes a little time. In long term it’s cheaper. Think of all the razors and waxing products you don’t have to buy anymore. Those products don’t seem that expensive, but that’s the danger. Because you spend small sums, you don’t see how much money it actually costs you in long term. It doesn’t hurt that bad. You feel a little sting when the laser touches your skin, but it’s just for a second. Unlike waxing, which still hurts after an hour… However, the more sensitive the skin area, the more it hurts. For example, the pain level of your arms or legs is lower than the pain level of your intimate area. No one can ever tell you had hair. It’s gone and it doesn’t leave any traces! There’s a period of 4-6 weeks between the treatments, so you can pay in instalments if you think the amount of money is too much to pay at once. Also perfect for students, like me. It takes a while before the hair is entirely gone. Depending on your skin type and hair type, it takes about 5-8 treatments. And there’s 4-6 weeks between two treatments. In short term it’s expensive. But like I mentioned above at the pros, in the end it is cheaper. It’s just that you have to pay more money at once. You have to avoid sun. For many people laser hair removal sounds a little scary. I completely understand, because I was one of those people. But after doing a little research and seeing people in my environment doing it too, the only thing I could think was: “Why didn’t I start earlier?” I’ve had two treatments now and I can already see progress. I have pale skin and very dark and thick hair, so that’s why it goes a little faster with me. If you were planning to do laser hair removal, but you’re still in doubt, I suggest you should just do it! Especially when you’re young like me! I’m 22 years old and starting with the hair removal now means I still have manyyyyyyyyyyy years of being hairless! However, age doesn’t play that big a role; it’s just that you can enjoy it longer. My mom and aunt (age 47 and 43) started the laser hair removal last year and now they can’t stop! And can you blame them? The skin is so soft, as if they’ve never even had hair. I started with my bikini line, but I’m planning to do my face, arms, armpits and more. All in all you can say that in long term laser hair removal DEFINITELY is the thing to do. The only disadvantage I can think of is that it takes a little longer before you see results, but the results definitely compensate for this. I mean: no more hair. Helloooo freedom! If you want me to do a "diary" post about the laser hair removal, please let me know. I want to start this summer again and in case you want a post about it, I can take "before" pictures soon. Tip for UK based readers! If you were planning to do laser hair removal, and you’re based in the United Kingdom you should have a look at Sk:n Clinics. When you go for laser hair removal, I can imagine you want to feel comfortable. Hair removal is kind of intimate (especially if you decide to do your private parts). The people at Sk:n Clinics are very friendly and helpful. Also, if you have questions for them, no need to hesitate to ask them! They have many locations throughout the UK. I hope you enjoyed this informative post. I know it's much information, but I tried to write down everything I wanted to know too before I started the treatment. I’ve wanted to write this post for a long time. I'm starting the treatments soon again (for my face this time), so I decided that this is the time to do it! If you have any questions about my experiences, you can always ask them in a comment or you can contact me. However, I’m not a professional, so I can only tell you about my experiences and about the information I gained. But you can always contact a clinic for any questions! Have you considered/tried laser hair removal? However, this is a post I wanted to write for a long time. Sk:n clinics has had no influence on me wanting to write this or on the text itself. Better yet, all the information in the post is written from my knowledge; nothing is copied from their website. And I was free to write whatever I wanted. Read my disclaimer here. Thank you so much for doing this post! It's always been something i've thought about but never been able to find much information on. It's good to hear both the pros and cons. I can be only pro about this. After using wax and razors for a long time, I decided to go for a laser hair removal treatment by Dr. Jerome Edelstein, in order to skip having this kind of problem. And it was useful, finally I got rid of my unwanted hair and most of all it wasn't painful at all. Very useful post. Thanks for sharing this information! To withstand the rough treatment, select optical device levels sheathed in seamless assembly and waterproof heads. For double protection, the degree are bolstered with plastic and welded metal exteriors. Good article on the pros and cons which I think everyone needs to read and understand before going ahead with anything that involves this laser and ipl technology. There is something unique about them. VLCC provides a state-of-the-art laser treatment for permanent Laser Hair Removal skin rejuvenation and acne for both men and women which are approved by FDA. Before picking best laser hair removal clinic, it is imperative to discover one where the staff has the best possible capabilities to play out the method. Search for an expert who is board-affirmed in dermatology or corrective surgery. In the event that a medical caretaker expert or doctor's partner will be the one doing the treatment, make sure that there will be a specialist on location to direct. Laser hair removal is a therapeutic strategy, and ought to be dealt with like one. People face the cons when they don't give much attention to the technique and warnings. It is strictly advised to not use this if you have scars or dark skin but still people neglect such little things and end up getting their skin burned, however, there are some hair removal laser machines that work for every skin tone. The characteristic look may be in style, however, that doesn't mean ladies aren't at present running to their closest laser centers to dispose of their undesirable hair. Because a lady wouldn't fret letting the hair under her arms or around her pubic region develop in, that doesn't mean she's essentially attached to the dim hairs on her lower back or upper lip. Styles are continually changing, however, a portion of the nation's most mold forward ladies exhibit that hair expulsion is a pattern that won't leave at any point in the near future. it really depends on different individual. laser hair removal doesn't guarantee permanent hair removal as well. epilator is the safest device for hair removal without any symptoms, however some selection process and perhaps reading out epilator reviews before buying one will be a wise choice.